As many of you know, I am very passionate about the ingredients that go into the food we eat, and am constantly disappointed at the FDA’s willingness to allow certain ingredients in our food. It is still unbelievable to me how ingredients that are banned in Europe are still allowed in food products in the US. And if you have a little one, you probably have come across my baby formula investigation because it’s ridiculous what’s allowed in some of the first foods that our little ones are exposed to! All of these ingredients are a little bit different in terms of their risk level, and in terms of what issues they cause! 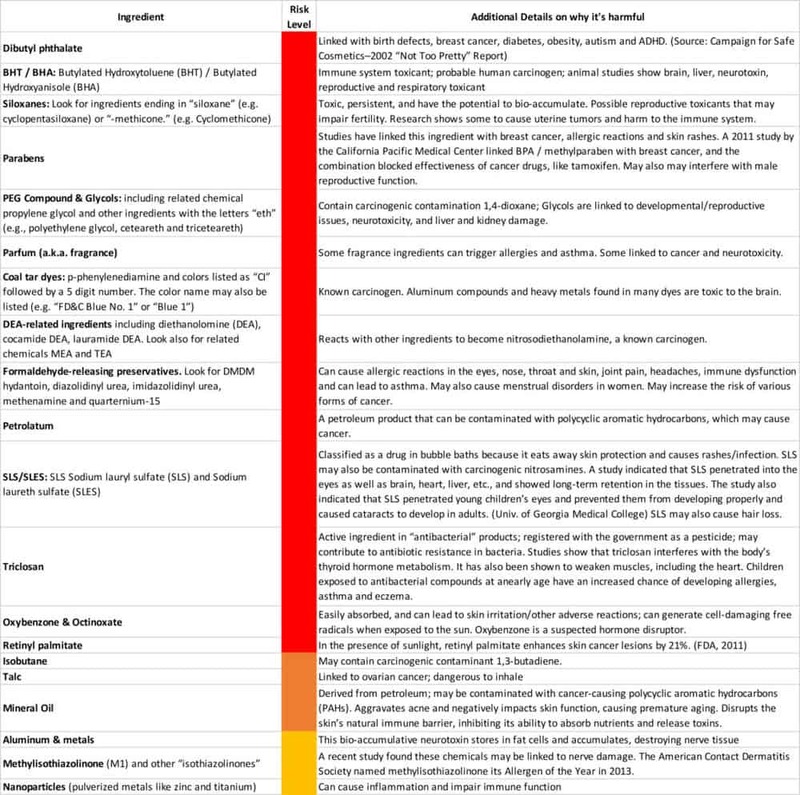 So below I have a chart with more details on how risky these ingredients are, whether they are a known carcinogen or endocrine disruptor, and where they are commonly found. (Note on endocrine disruptors: they can mess with brain/nervous system development, reproductive system function and hormone levels, and metabolism/thyroid/adrenal function). So what should you buy instead?? #1: Pure Haven or any of Dr. Bronner’s products (e.g. their soap/shower gel and baby products). 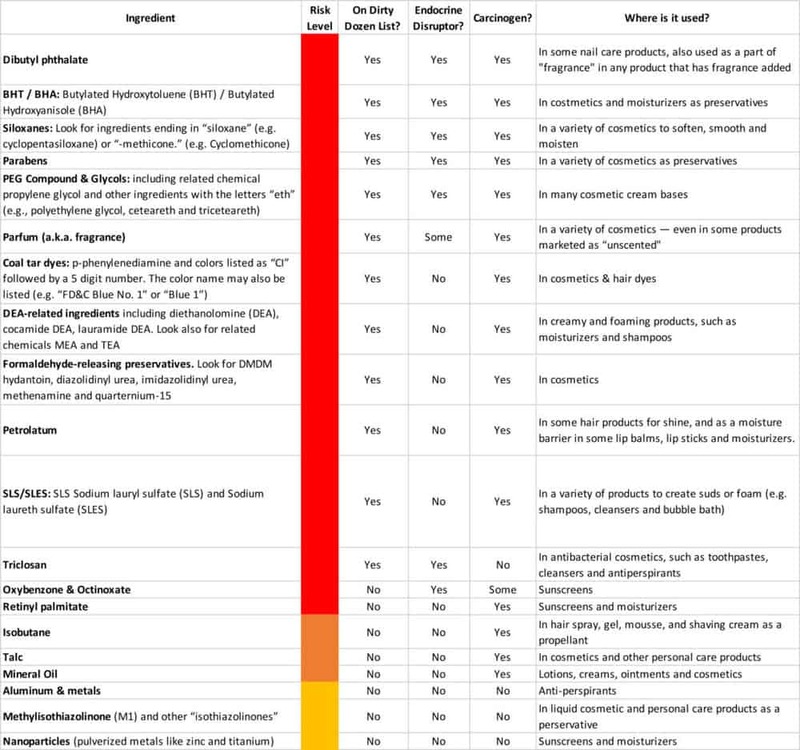 I love both of these product lines because their ENTIRE line of products are all clean and free of every single one of these harmful ingredients. All of the ingredients in both of these brands are organic, and Pure Haven’s products are made in a USDA organic food-grade certified facility and are shipped fresh within just a few weeks of being made. Pure Haven also has a 60 day money back guarantee, even if you’ve used the product. No other company comes close! 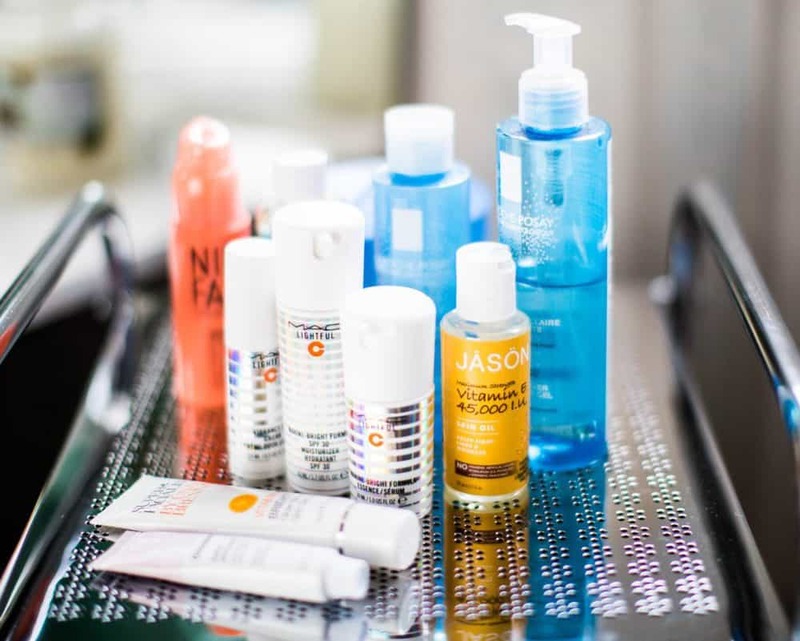 The only reason Pure Haven might slightly edge out Dr. Bronner’s is that they just have a more extensive product line that includes all skin care products including exfoliators, cleansers, eye creams, moisturizers, face masks, etc. which I use on a daily basis! #2 | Acure Organics: Another super clean product line, but occasionally they may use potassium sorbate or sodium lauryl which are preservatives, and all of their products aren’t made with 100% organic ingredients. #3 | California Baby: Their main issue is the use of sodium benzoate – which, when mixed with vitamin C, forms benzene – which is a carcinogen. They also have a few preservatives and they don’t have 100% organic ingredients. #4 | Avalon Organics: They have more preservatives than Acure or California Baby, and they use sodium benzoate, which is why they are #4. For any product you have questions about, go to the EWG’s database and the safecostmetics site. Buy your products online! So many more options than at the drugstore and you don’t have to go to multiple stores to buy all of your products. 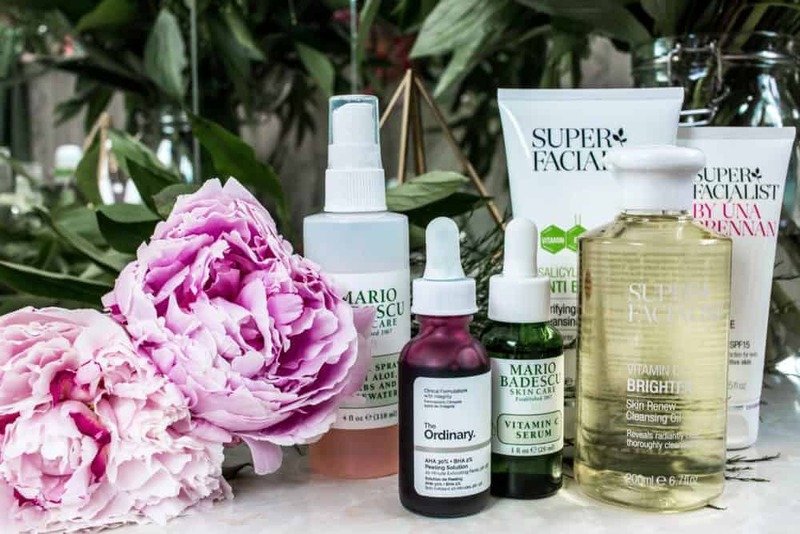 Adopt a minimalist approach to your beauty routine – do you really need all 5 products that you currently use for your hair or face? Or would pairing down to 1-2 great products save you money, time and reduce your exposure to harmful toxins? If you swap out just 8-10 of your daily routine products you could greatly reduce your exposure from 300 hazardous chemicals to almost zero. 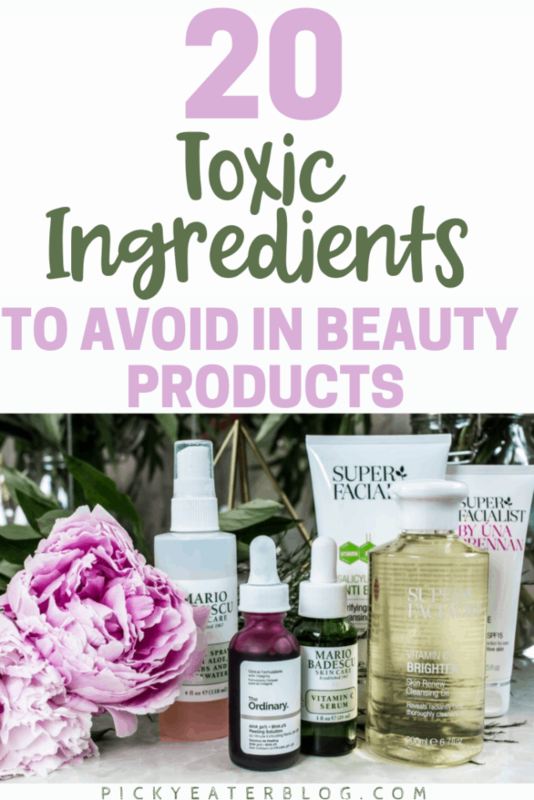 I hope this post was helpful in breaking down the ingredients in beauty products today and helps you to find safer options for you and your family. If you have any questions about any of this, you can leave a comment below or email me at pickyeats@gmail.com. I respond to every single message and comment I get!